Severe flaws in the building’s brick veneer cladding, combined with its height and proximity to sidewalks below, posed serious life-safety hazards to pedestrians below. Use of improper reinforcing caused widespread and severe destruction of brick window surrounds, posing a life-safety risk to pedestrians below. 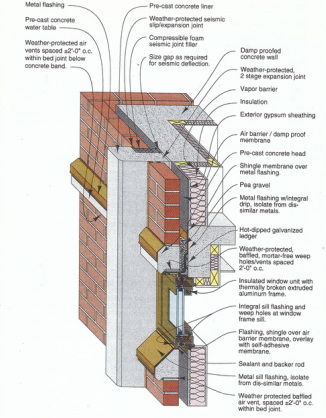 The PL:BECS report included highly-detailed recommendations for correcting the brick veneer cladding’s many flaws to restore structural integrity and stop further degradation and interior leakage. Placement of improperly sealed copper flashings in contact with steel support ledgers caused widespread and severe electrolytic corrosion, compromising the ledgers’ structural adequacy. Project Summary:	Within a decade of its construction, this 7-story building began manifesting the consequences of its ill-advised design and inadequate installation. Severe cracking plagued its poorly-conceived, projecting brick window surrounds, causing chunks of brick to drop randomly onto the walkways below, posing a severe life-safety hazard. Additional cracking affected the brick cladding in numerous locations, reflecting the complete absence of vertical or horizontal expansion joints. These, and many other symptoms made a complete evaluation advisable. PL:BECS Services:	PL:BECS performed a detailed evaluation of the building’s exterior brick cladding and windows. Services included a detailed visual examination, non-destructive evaluation of masonry anchor densities, masonry absorption testing, and infiltration detection, as well as surgical openings in the cladding to examine supporting ledgers, flashings, veneer ties, and other components of the building’s exterior envelope. The investigation revealed that the brick cladding suffered from a multitude of serious design and installation deficiencies. The projecting brick window surrounds, which had been reinforced with standard wire reinforcing, were experiencing severe and dangerous cracking brought about by the expansive corrosion of the reinforcing. Absence of expansion joints produced widespread cracking of the brick cladding. Use of copper flashings in direct contact with steel ledgers with no corrosion protection caused severe corrosion of these ledgers, compromising the structural integrity of the brick cladding. This was further exacerbated by inadequate securement of the brick cladding to the structure via veneer ties. PL:BECS prepared a detailed evaluation report summarizing the observed flaws and analyzing their impact on the building’s long-term integrity. Due to the overlapping multitude of problems plaguing the building’s cladding, the report concluded that the only cost-effective long-term solution to restore integrity and life safety was to replace the entire cladding with a new, properly designed brick veneer, at an estimated cost of 4.2 million dollars in 1994.